There are many dump carts on the market, picking the best one to meet your specific needs can be overwhelming. This Top 05 list of the best dump cart will help you weigh the benefits and drawback that each of the top contenders has to offer. This review will also narrow down specific features each model has to offer and help you evaluate which type will work best for you. 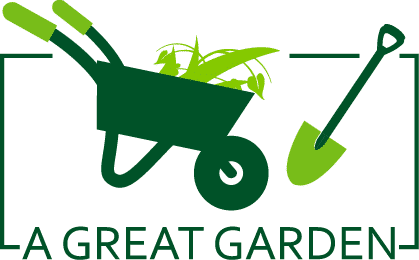 This list will also help you determine what features to look for when purchasing the best garden dump cart of your own. 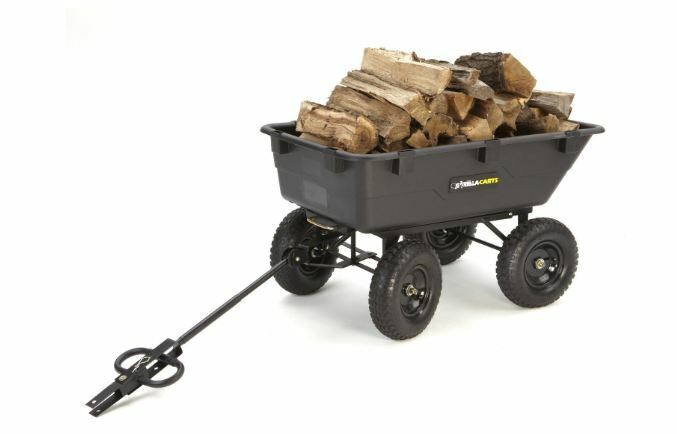 The Gorilla Dump Cart makes the top of the list because it comes with all the bells and whistles and is equipped to handle heavy duty garden tasks. 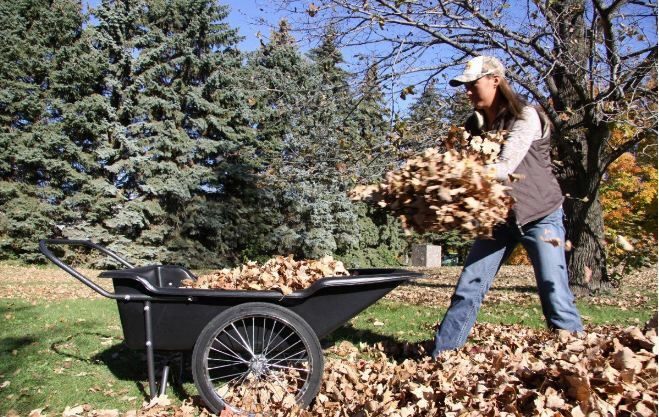 Structurally sound, this garden dump cart is supported by 10-inch pneumatic tires, and a stainless steel frame is measuring at 19.5 x 20 x 38.7 inches. The Gorilla Garden Dump Cart weighs approximately 32 pounds while supporting a load of up to 600. Gorilla dump cart also features a deep 36 x 20-inch bed that has a rust-free poly finish, which is useful for sticking it to the brim with garden tools and supplies, and never having to worry about it rusting. What makes the Gorilla one of the top products that I recommend, are its subtle features that add comfort, easy transportation while still providing rock-solid durability.It is built to make the toughest jobs easy. Includes a padded handle that makes moving heavy loads easy and comfortable, no more callouses! Patented quick-release dump feature allows for moving heavy objects without the strain of lifting them out, saves time and fatigue! Can support a load of up to 600 pounds, no job is too big for this cart! The 10-inch pneumatic turf tires and 5/8-inch diameter axle allow the cart to move quickly through ALL terrains. No worries of getting stuck, losing a tire or tipping over. Poly finish for rust-free, low maintenance care. The cart bed measures 36 x 29 inches giving room to fit all of your supplies, lumber, bricks, mulch, or soil easily in the cart. 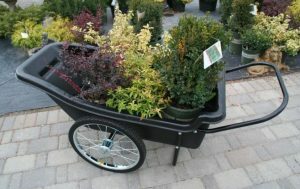 Wheels are approximately 18″ apart and allows for easy movement of the cart through a raised garden bed. Maneuvers easy enough for a child to use, but sturdy enough to make your old wheelbarrow obsolete. Front wheels pivot and turn.Tight spaces are no problem to move around. Manufactured by a reputable company Tricam, that offers quality products and provides customer support. Requires assembly, and the building may be challenging for some. The tools needed to build the garden cart are standard tools a majority of people have at home. It comes with easy to read instructions, which follow a simple progression from opening bags of parts one at a time. As long as a non-grassy area is used for assembly, and the directions are read before building, the assembly can be quite easy. Strong rubber/plastic smell from the tires is notable upon opening the cart. When items are packaged for shipping, they don’t receive air circulation, which can give off a strong smell when they are opened for the first time. Setting the product outside, or in the garage for a couple of hours will give it time to air out. The Agri-Fab is one of the best carts because it easily converts from a push-cart to a tow- cart in seconds. It measures 8 cubic feet and soundly rests on 14 x 4 inch ribbed, pneumatic wheels with a 5/8 inch diameter axle. The cart weighs 66 pounds and can support a load up to 350 lbs. 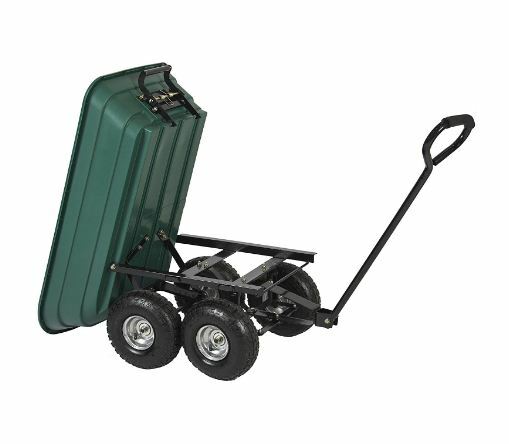 The push/tow dump cart also has a durable poly finish. What I like about this model, is that it gives an extra hand to those with a significant amount of property to cover, it easily tags along with the added tow package. Versatile design allows for multiple uses: towing, hauling, and dumping. This feature also makes it easier to load materials. Poly bed with powdered paint finish provides scratch resistance, rust-free protection, and easy clean-up. The lawn cart can take a beating, without showing it. Steel frame supports a load of up to 350 pounds. Moving concrete, yard waste, and garbage is easy to transport. The lawn cart contains a hitch with a pin and cotter key, so it can be attached to a tractor, making this cart efficient for people with small to moderate lawns or those with acres of land to care for. Single release lever dump mechanism, makes unloading the cart easy, without strain. 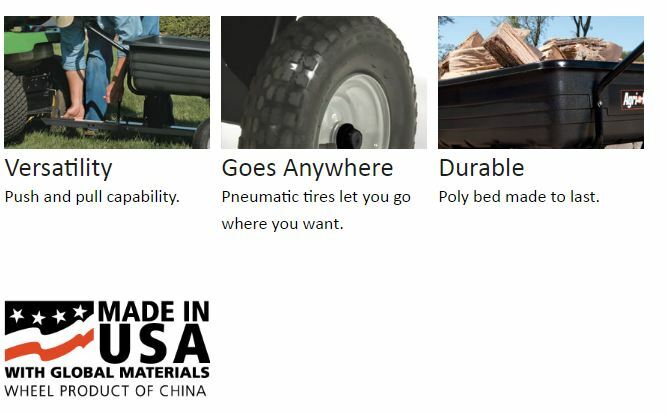 14 x 4 inch ribbed, pneumatic tires provide smooth handling in all terrains and seasons, for year round use. Wide handle for better control and allows for pushing or pulling. The garden cart has grooves on the floor bed, which may collect debris after dumping. This can be remedied by hosing it off after use or lightly wiping it down. The cart weighs 66 pounds. It is heavier than some other brands, but maneuvers easily and is built strong enough to handle a wide range of heavy duty garden needs that a lighter cart might not support as well. To download the assembly/installation guide, click here. The Polar Trailer Utility Cart makes its place for its sleek design and heavy duty load bearing capacity. The Polar Trailer Utility Cart is around 10 cubic feet measuring at 65×29 x29″. This cart has large 20″ spoked wheels and weighs approximately 49 pounds. This cart features a polyethylene tub that is strong and high impact. The Polar Cart is man’s best friend, as far as garden carts are concerned, strong, rugged, and reliable. 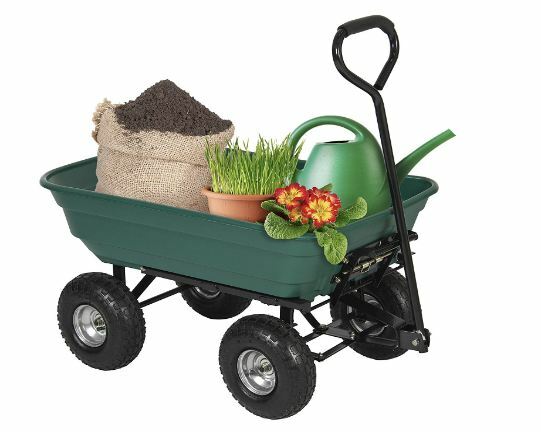 This garden cart features solid rubber tires to alleviate any worry of getting a flat. Sleek design allows for pushing and pulling to meet any job that is required. Plastic body that guarantees rust will never be a problem can be left in the elements such as rain or snow, without worry. The high impact design of the body can accommodate messy loads like boulders, jagged tree branches, or lumber without fear of denting the cart. Large spoked wheels provide stable movement up hills or over uneven landscapes. Design of wheelbarrow is superior to other wheelbarrow type carts, because it is made to unload easily without tipping over. Plastic design made to be as durable as wooden carts, without the worry of wood deteriorating from exposure to elements. Safe to use in rain, snow, or even afloat in water if need be. Large design may pose a challenge when moving up the staircase. This product is not designed to move loads up and down stairs, but as for garden purposes, can be finessed over a curb or a couple of steps. The wheels do not sit flush to the body and can snag a doorway if not paying attention. The dump cart allows for a push-pull design, so pulling it through the doorway as opposed to pushing it, will allow for a better field of vision to prevent accidental snags in doorways. 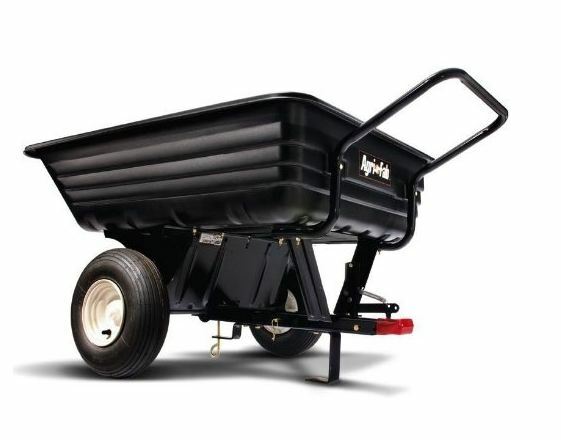 Much like its sister product the Gorilla GOR200B Poly Dump Cart, this product makes the list of best lawn dump cart because it provides serious hauling power with intricate features that allow convenient use in the yard. 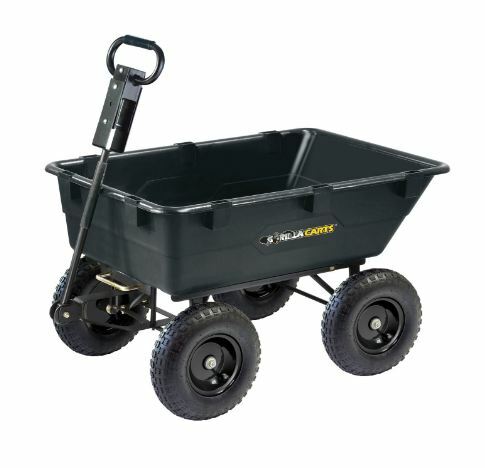 This dump cart has a 40″ x 20 ” rustproof poly bed, with 4- 13-inch tires. This cart features a steel frame and can support up to a whopping 1200 pounds; this cart means business! Even though it can support a load the size of Texas, it weighs a mere 58 lbs. 2 in 1 convertible handle with a patented D-shape, can be used for pulling or attaching to the hitch of a tractor or ATV. 40″ bed to maximize space for big loads, all while saving extraneous trips back and forth around the garden. 4 – 13″ pneumatic tires with 5/8 ” axles prove to be superior in handling even the most rugged terrain. This product uses bolts to firmly lock components into place, no more worries of welded areas breaking apart. Heavy load balance makes for ideal use on the homefront, or for more commercial jobs. Single release feature in handle makes for easy dumping. Moves an extremely heavy load without hindering mobility. Some hardware issues have been reported when assembling, but most parts can be easily replaced through the manufacturer, or even at a hardware store for minimal cost. Cart requires assembly, can be frustrating for those who have trouble with assembling products. The company offers support and an instruction manual. The tools required for assembly are common tools most people have lying around their house. This dump cart, as with most others, do not have breaks. If you are working on a hill or area where the cart can roll away, turning the cart horizontal to the slope will prevent it from rolling away. The Best Choice Products Garden Dump Cart Wheelbarrel Waggon Carrier offers a very basic, sturdy model to get any garden job done. This cart also features a poly bed that rests on a steel frame. This dump cart weighs 31.3 pounds and measures 40″ x 19.5″ x 37″. The bed itself measures 37″ x 18″ x 7.5″, offering a decent amount of space. WHat’s great about this product is its come as you are an approach to gardening, it isn’t fancy, or highly tailored, but it does a good job at doing the basics. It gets everything you need from point A to point B with no fuss, no hassle, and most importantly–no strain. This garden dump cart’s design is a no fuss, basic model to meet garden needs without the hassle of extraneous or technical features. It’s simple, reliable, and durable. Front tires pivot for easy steering. Simple lock feature allows for easy dumping. Provides support of up to 650 pounds, while only weighing 39. This cart is less heavy than other models, making transporting, using, and storing convenient. Easy assembly allows you to spend your time on your gardening projects, instead of wasting hours on building your wagon. Sturdy stainless steel frame that can be folded for easy storage. Directions come in small print, may be difficult for some. The manual can be found on-line, and text size enhanced for clarity. Best Choice Products Garden Dump Cart doesn’t have some of more elaborate features that the most expensive models have, but is reasonably priced and offers a simple and user-friendly cart. Preparing yourself for the Ins and Outs, and figuring out your needs are half of the battle when purchasing any product. Going in blindly and relying on fleeting salespeople can turn out disappointing. When finding the best products on the model, no one is a better judge than you, and we gladly enjoy walking you through that process. This top 05 dump cart reviews has designed to do the legwork for you and steer you in the right direction to find a product that you need, and love.Once you have considered your needs for purchasing a garden dump cart, this review is the perfect go-to-list for selecting from the Top 5 carts on the market. BTW, you may ask me among the 05 models, which one is the best. After a deep research, I would highly recommend you to choose Gorilla carts GOR200B model as it performs the best among the rest.